MSPs vote to back Derek Mackay's Scottish rate resolution, which will set income tax rates for 2019-20 for Scottish taxpayers. 61 MSPs backed it, 52 did not and there were six abstentions. This vote allows the Budget Bill to be debated at stage three on Thursday afternoon, join us then. Transport Secretary Michael Matheson says it is disappointing that Gemini have taken the approach they have. They have refused to postpone or delay their consultation exercise despite representations, he says. The minister calls upon Gemini again to delay any decisions relating to this particular site to allow work to be done to save it. He says Transport Scotland and himself have been engaged with Gemini. James Kelly said: "Scottish Ministers must intervene and announce the electrification of the site to allow the depot to connect to the Glasgow to Edinburgh rail line at a cost of less than £1m." Green MSP John Finnie says the St Rollox site is the largest rolling stock repair site in Scotland. He agrees with previous speakers that the depot must be electrified to ensure new stock can access it easily. While accepts new trains will leads to less demand for repairs, Scotland will be at a disadvantage if it cannot maintain its only rolling stock Mr Finnie adds. Tory MSP Annie Wells regrets these historic works are under threat. Ms Wells insists: "The situation is at a critical point." "I believe the government should be doing all it can to secure the future of this historic site." She hopes more discussions are planned between all stakeholders and calls for the consultation period to be extended to help save the site. Labour MSP James Kelly welcomes members of Unite and RMT to the chamber this evening. We shouldn't be ending the history or economic benefits of this workforce on 4 March, he argues. Mr Kelly calls for the government to intervene. Labour MSP James Kelly is leading a debate on the proposed closure of Glasgow Works - formerly known as St Rollox Railway Works - in Springburn. Social Security Committee convener Bob Doris is highlighting his committee's inquiry into social security and rented housing. The committee is to consider concerns that the system is not offering enough support for people to allow people to rent an affordable home. 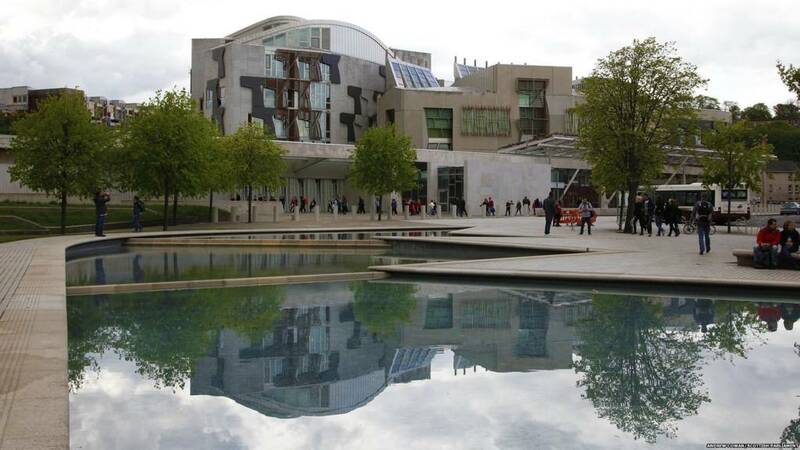 MSPs are to reflect on the possible impacts of Universal Credit or changes to the local housing allowance. So ever onward with the budget, join us on Thursday! Public Finance Minister Kate Forbes criticises the UK government's immigration policy. Ms Forbes argues the Tories' tax policies would cause a £500m cut to public services. "We will continue to target our investment to support people into work and we are continuing to tackle the causes of poverty." She turns her attention to Labour and the Lib Dems criticising their tax policies and approach to localism. The public finance minister argues the Scottish government's income tax policy will raise £11.5bn to support the best outcomes for Scotland's people and economy. "Scotland will continue to be the fairest and the lowest taxed part of the UK." Tory MSP Dean Lockhart says the only sustainable way to deliver increased public spending in Scotland is to grow the economy, not increase taxes. Increasing taxes will only damage the economy he insists. The UK government has reduced the taxes of 2.4 million low paid workers by increasing the personal allowance, he argues. Meanwhile the Scottish government has increased taxes on middle earners, he adds. At the same time, other measures like the workplace parking levy will hit low earners hardest, Mr Lockhart says. "Where is the fairness in that?" the Tory MSP asks. Labour MSP Elaine Smith says the SNP are wrong to propose a rate resolution that will increase wealth inequality and which is regressive and will leave councils struggling to deliver statutory services. Ms Smith argues Derek Mackay is forcing councils to make tough decisions on council tax and calling it empowerment. The finance secretary has lifted the 3% cap on council tax and risen it to 4.79%. She adds: "Orwell's doublethink and newspeak could have been written for Derek Mackay." The Greens abstaining tonight is hardly principled, she says. Labour would reintroduce the 50p top rate, Ms Smith tells the chamber, and reiterates her party's plan to vote against the resolution shortly. This time last year, Derek Mackay was being the radical. The SNP's finance secretary tore up the income tax system to create a new one for Scotland, and set course for divergence from the Westminster line by dipping into higher earners' pockets. So what can be made of this Budget? Mainly that it was less about change, and more about sending political and some economic signals. Use our budget calculator to found out how your pocket may be effected. Mr Rennie says he does not support giving local government "a bunch of taxes" which won't raise the money they need and calling it local government reform. It is another example of this government treating councils with disrespect that has become the norm, he argues. The Lib Dems will oppose the rate resolution and he insists if the Greens were really angry, they would join them. But as ever it is all about independence, no matter the damage to progressive politics, the Scottish Lib Dem leader concludes. Scottish Lib Dem leader Willie Rennie wonders why Patrick Harvie is not going to vote against the resolution at 5pm. By abstaining, the Greens will allow the SNP win this evening, he points out. Mr Rennie argues for a modest tax rise to secure a significant investment in education. He too accuses the SNP of breaking their manifesto pledge on income tax and of dishonesty. Mr Rennie says so far the Scottish government has been careless with this budget and criticises the introduction of a tourism levy and the workplace parking levy. He says the SNP is ramping up tax in a wide range of areas and at every budget.